Skoda's original Octavia was always a rather appealing car but the estate versions have always seemed to make a little bit more sense. For a start, they're a little more elegantly proportioned than the hatch. They lose very little in terms of driving characteristics, the range includes a tough all-wheel drive variant and they're ruggedly practical as well. Now could be a very good time to pick up a well looked after Octavia estate for less than you may expect. The Octavia Estate has had a rather piecemeal development with each product line being introduced as and when it became available. The estate versions were launched months after the hatchbacks, and engine choices appeared and disappeared. The original range consisted of 1.6 litre cars in GLXi Estate 101bhp trim, and 1.8 turbo cars, introduced in October 1999. The 1.8 is the familiar 1.8T turbo unit as seen in the Golf, Passat, Audi A3 and many others, and replaced a normally aspirated 1.8 unit. The 2.0 litre cars were introduced at the same time in GLXi or SLXi trim. A pair of 1.9 litre TDi diesel engined cars were also available. 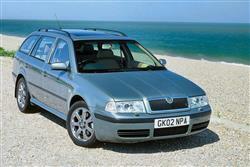 The 90bhp GLX TDi followed, and the range topping 110 bhp SLX TDi was a very desirable compact estate. The diesel-engined models proved very popular with UK buyers, with the 90bhp unit selling in the biggest volumes. An SDi Classic estate was also offered but this is best avoided unless funds are really tight. In October 2000, a revised range appeared with new Classic, Ambiente, Elegance and Laurin&Klement trim derivations. There were minor interior and exterior styling changes, price reductions and specification improvements. The 150bhp 1.8T petrol 4x4 estate followed in January 2001. In winter 2002, the RS was renamed the vRS and an estate version was made available. A TDI 130 diesel followed in the spring of 2003 and summer 2004 saw the second generation Octavia hatch debut. The 'old' shape estate continued on Skoda's books in 2004 as they awaited the intro of the replacement car readied for early 2005. In five-door form, the Octavia has already been a roaring success throughout Europe, offering Mondeo-sized virtues at Astra-sized prices. Thousands of family hatchback owners have traded up to the larger car they thought they couldn't afford. For the estate version, the prospects have proved to be just as bright. Estate versions of models like the Ford Focus, the Vauxhall Astra and the Ford Focus are impressive cars but they're not much use if you want to carry a fridge freezer, a grandfather clock or a couple of Dobermans. The Octavia, in contrast, can, in this guise, carry 548 litres, or 1,512 litres with the split rear seats folded - more than a Peugeot 406, a Vauxhall Vectra or a Renault Laguna. The load space is versatile too, with glide rails embedded into the floor to make loading and unloading easier. There are also four fastening points to keep awkward packages from sliding about. As you'd expect from a car of this class, a roll-out cover pulls from a housing attached from the back seat, keeping your valuables out of sight. Finally, the space-saving arrangement of the rear axle and suspension allows for a surprisingly wide estate compartment - over one metre at the narrowest point between the wheelarches, which could make all the difference. Clearly, this is no compromised 'lifestyle estate'. Which is not to say that this Octavia is visually unappealing. Quite the opposite in fact. Dirk van Braeckel and his Design Team have created a shape most will feel to be sleek and modern. A modern prestigious badge could easily adorn the prominent chrome grille: your neighbours will certainly expect it. Ask a Skoda dealer what goes wrong with Octavias and you're likely to have a short, if slightly dull, conversation. In the words of one dealer, Octavias are 'bulletproof'. Certainly, they're every bit as well put together as a VW Polo or a Golf - a fact confirmed by VW Group in-house surveys. Still, check for wear to loading floors on the estate models and make sure that servicing has been properly carried out. Early 1.8-litre cars had problems with ignition coils but these will largely have been ironed out by now. Check the 4x4 Estate for evidence of overly enthusiastic green laning and it's well worth checking tyres, suspension alignment and panel fit on the vRS estate. Whilst not recommended, if you were to close your eyes whilst driving an Octavia you'd think you were in a Volkswagen. Golf, Bora maybe even a Passat, and when you did crash, the Skoda offers similarly good protection. Behind the wheel, the Octavia offers a more solid and confidence inspiring drive than many of its rivals. The body shell feel stiff and the ride is fairly firm. Refinement is good, although the smaller diesel engines can become intrusive when worked hard. The gearboxes are the usual VW Group fare, slick and easy to use. The best Octavias for keen drivers are the 1.8T models. With a 0-60 time of only 8.5 seconds, there's plenty of opportunity to let a BMW Z3 2.0 get a good view of your boot badge as, conditions permitting, the 150bhp 1.8T Octavia runs to its 134mph maximum. The vRS is a real ripsnorter and has become a darling of the aftermarket tuning industry, offering easily upgradeable performance. The TDi 90 is good enough for most, with a reasonably sedate acceleration figure but a far more salient 43mpg in urban conditions. On a run expect the high fifties. All Octavias come with a three year/45,000 mile service and maintenance package in addition to a three year unlimited mileage warranty, so buy nearly new and this could all be yours. The Skoda Octavia Estate offers rugged build quality and no-nonsense carrying ability at a price that's scarcely credible. The 90 and 100bhp diesel models are probably the pick of the range but the vRS is well worth a look if you want subtle speed. Recommended.